The fourth episode, called “Unshackled,” reveals who was behind the attacks. Amazon offers an attractive Asterisk War t-shirt. You can order yours here! Julis-Alexia van Riessfeld arrives at the place designated in the letter she received at the end of the previous episode. There, she discovers Silas Norman, one of Lester MacPhail’s lackeys, who discloses that he was behind the attacks. 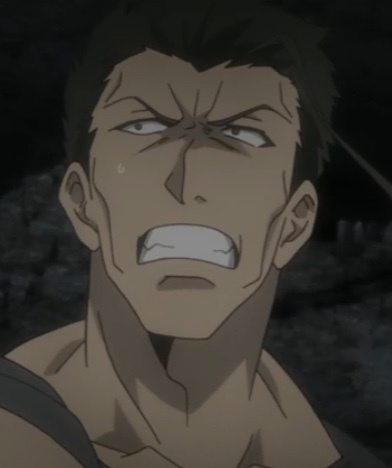 Lester arrives, having been tricked into thinking Julis accepted his challenge, and discovers that Silas intends to kill both of them and make it look like it was Lester was behind the assaults. Silas unleashes dozens and dozens of his combat dolls against them. Despite his best efforts, Lester wasn’t a match for Silas’ puppets. Capture from the Crunchyroll stream. Lester falls quickly. The more powerful Julis fares better, but sheer numbers began to wear her down. Just as Silas and his puppets were about to kill her, Amagiri Ayato arrives and escapes with her to another floor. He confesses that she’s now his purpose in life. Silas rudely interrupts to renew his attacks. Carrying Julis all the while, Ayato defends until he figures out Silas’ patterns. 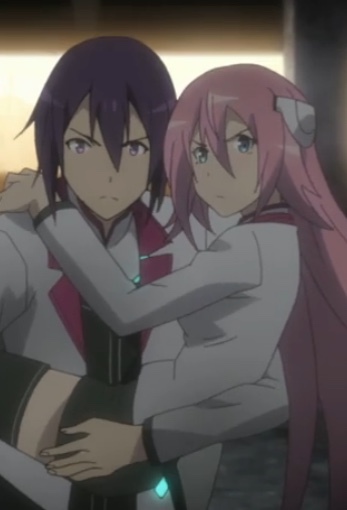 Julis seemed to get used to being carried after Ayato assured her she wasn’t being a hindrance. Capture from the Crunchyroll stream. Moments later, he demolishes the puppet army. When Silas tries to escape using a flying puppet, Julis lifts the two of them after Silas, since she can fly and Ayato can’t. They knock Silas out of the sky, and he falls where Claudia Enfield meets him. Remember the chains that appeared around Ayato in earlier episodes? They strike again before the two of them can land. After he passes out, we learn that his sister had placed a restriction on his user of power just before she left, apparently to participate in the battle we saw at the beginning of the first episode. He awakens to find his head pillowed on Julis’ lap, and they share a touching conversation. They decide to team up for the Phoenix Festa. The scene switches to Claudia as she catches up with Silas and nearly kills him. A figure who’s a member of the secretive Shadow Stars realizes that she won’t go public so she can put Allekant in the position of owing her a favor. The figure was Yabuki Eishirou, Ayato’s roommate. At the very end, we find out that the Allekant student who created Silas’ puppets was watching the whole affair, and that events are following her plan. I’ve grown to enjoy the opening theme, Brand-new World, performed by Maaya Sakamoto and written by Shiena Nishizawa. It’s available from CD Japan. It sounds simultaneously upbeat and martial. 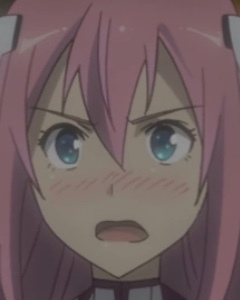 I like how the series portrays Julis’ thought processes and decisions. She went to confront the attacker less to protect herself and more to protect Ayato. This felt consistent with what I think I know about her character. It makes her all the more sympathetic. I enjoyed the computer-generated imagery (CGI) of the doll battles. It blended well with what looked like the traditional character animation. In particular, seing dozens of dolls rain down from holds in the ceiling was chilling. I had a real sense that neither Lester nor Julis stood a chance! Julis figured out Allekant, a rival school, was funding Silas based on her observations while she was fighting. She’s capable and perceptive! After so many years of “damsel in distress” heroines, it’s refreshing and invigorating to see a strong female lead. When Ayato escaped with Julis to another floor, I enjoyed Ayato’s reasoning: Julis fought to protect the kids in the orphanage. “Well, then, who’s going to protect you, Julis?” Again, she’s no damsel in distress. Instead, she’s a co-combatant fighting along side him. They support each other. I also thought she looked adorable when he told her. As powerful as she is, Julis is easily embarrassed! Capture from the Crunchyroll stream. While Ayato, he carried Julis the whole time. It wasn’t because he was trying to impress her; that was the most efficient way to keep her safe. After getting over the initial shock, instead of demanding to be put down (and disrupting the flow of battle), she was simply surprised that she wasn’t hindering him. In this episode, her respect for his power reached a new level. When Silas released the queen puppet, I loved Ayato’s reaction. He gives a little sigh (as if saying, “Great, another one to deal with before I can go get pizza”) before slicing it to pieces. While I enjoyed the conversation between Ayato and Julis on the roof as night fell, I wondered if they should not have been more cautious. Granted, they had defeated Silas, but I didn’t see that they had any hard evidence that he had acted alone. To the contrary, Julis understood Allekant was behind the attacks. Wouldn’t it have been safer if the she had taken him back to Asterisk? Perhaps to the hospital? Ayato is undeniably powerful. He’s also modest about it. Capture from the Crunchyroll stream. Ayato is powerful, but he’s not a jerk about it. Nor is he self-effacing. He’s a pleasant guy to hang around who happens to be astoundingly strong. 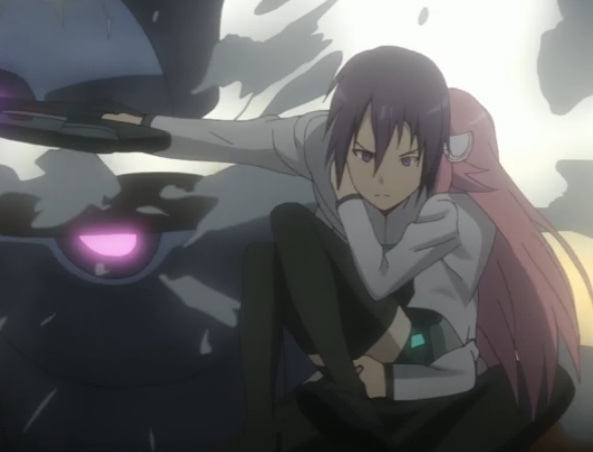 Julis is also powerful, and she has the added character depth of a sympathetic and compelling back story. She’s fighting for orphans, for heaven’s sake! It’s hard to get much more sympathetic than that. Claudia is flirtatious, and she’s also politically minded and astute. I also have to admire how up-front she was with Ayato about her love for scheming. She’s emerging as a major player in the larger diplomatic world between the schools. The theme of struggling against an unjust society, which was particularly clear in the previous episode, caught my attention. Not to get on a soapbox, but I think we need more struggles against injustice. Ayato and Julis’ relationship is between two equals. He’s not always saving her; she’s not always saving him. They’re fighting together. That’s the kind of romance I like to see. Time will tell if the next episodes will continue building in the right direction. So far, though, I’ve enjoyed the ride!